Remove the stalks from the cauliflower but make sure that the florets remain intact on each of the cauliflower. prepare a marinade by mixing all the ingredients for the marinade in a bowl. 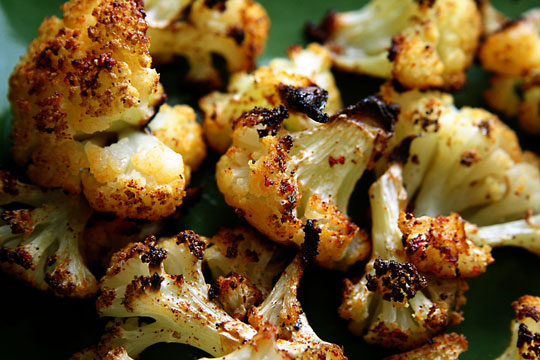 spread lavishly on both sides of each of the cauliflowers and leave aside for 1 hour. heat the oil in a non stick pan and fry each of the cauliflowers separately, turning both the sides so that the cauliflowers are half cooked. place the half fried cauliflower on a baking dish and sprinkle the remaining marinade over it and bake in a preheated oven at 180 degree C for 8-10 minutes or until the cauliflowers are tender and brown on the top. dear divya, thanx for ur suggestion.i'll try. Dear swati. nice recipe.Try this-there is no need to saute. Add little oil to marinade and roast. Cauliflower is something that goes well wit basically with everything or with out anything, just black stir fried with pepper and salt also gives it a wonderful taste. Thanks 4 sharing.